The new 2nd Edition is now available. If you are considering adoption of the interactive online version of College and Career Success, contact Carla Lundman of HumanEsources at carlal@humanesources.com . She can email you instructions for an online demo. She can also arrange a Go to Meeting to show the online text to your department. Here is a brief video introducing the online version. Contact Carla Lundman of HumanEsources at carlal@humanesources.com to set up your account and coordinate with your bookstore. 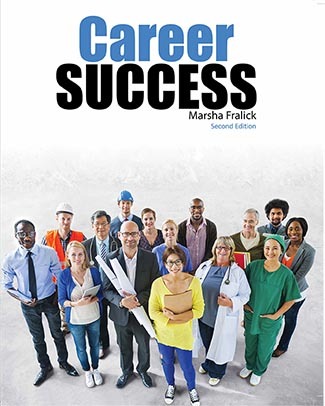 The current price of the printed version of Career Success is $40. There is als an interactive online version for $30. This version features an online career portfolio for the assessment results and career exploration links. Students can continue to use this portfolio as they progress through college and look for employment after graduation. They can upload their resume and continue revising it as they develop their career plans and look for employment on the integrated site Indeed.com. Faculty can view and comment on student work online. Both options include three career assessments (personality, multiple intelligences, and interests.) If you would like a demo of the online version, contact me at marsha@marshafralick.com . This edition features a new chapter on career satisfaction. build on their strengths, think positively about the future, and clarify what happiness means to them. The O*Net Interest Profiler is also integrated into the text. An online career portfolio summarizes the results of the assessments and provides links to the O*Net database of careers as well as links to current available jobs at Indeed.com. Material is provided to help students set goals based on personality type, interests, values, and multiple intelligences. Information is provided on current career trends, the career decision making process, educational planning, and researching career information and outlook. Updated job search strategies including online personal branding and using social media and other online job search tools. Journal entries help students think critically and apply what they have learned to their personalo lives. An interactive online editon, College and Career Success Online, is available. Individualand group exercises are included at the end of each chapter. The AchieveWORKs Personality and Intelligences assessments are included. Note that these assessments were formerly the Do What You Are and the MI Advantage. Visit www.humanesources.com Click on Login. Enter the Access Key: C2Q3X6V. Create an account to access the assessments and the career center.